Spring sprung this year March 20, and my thoughts turned to my Royal Enfield Bullet. The weather's beautiful here in Florida this time of year and my motorcycle was spending too much time in the garage. But where to go? As a former motorcycle commuter (when I had a regular job) I'm not the sort to just ride around in circles burning gas. I need a mission. So I came up with this: ride around town, finding settings in which to photograph my Bullet. Vain, perhaps, but still enough of a challenge to be interesting. I'll be sharing other photos in the future but my initial favorite is the Bullet in front of the "Greetings From Fort Lauderdale" sign now fading and flaking on a gate just off State Road A1A, the beach road. I don't know who had the idea for this mini-mural, but it forms a perfect "post card" background for tourist selfies. After the photos I stopped to fill the gas tank. Back home I rewarded the Bullet with a quick wash, finishing up with an oily rag wipe for the chrome wheels and headlight surround. A new elastic ring cut from the top of an old sock went around the gas filler opening to reduce evaporation. The wash job rewarded me by allowing me to spot a loose bolt holding a rear fender stay. There's always something. 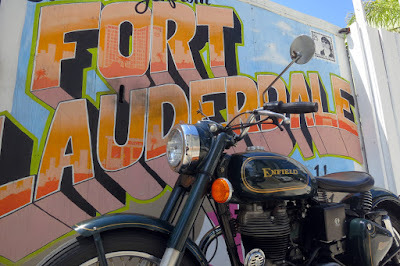 Do you have great hometown photos of your Royal Enfield you'd like to share?